Q: What is Orthokeratolgy (Ortho-K)? A: Did you ever wish you could wake up in the morning being able to see perfectly? By wearing Ortho-K lenses nightly, you can correct your vision if you are nearsighted to close to perfect vision. Your eye doctor will fit you with GP lenses that gently correct the shape of the front of your eye when you sleep. The correction remains for a day or two, so you must continue to use the contacts nightly if you want to maintain good vision during the day. Interested in trying Ortho-K lenses? Book a consultation today. Q: How do I know if I have Dry Eye? A: Dry eye can cause quite a few symptoms, anything from the eyes actually feeling dry to the eyes watering often, or having a burning, itchy, or irritated feeling. One of the most common symptoms is the eyes feeling gritty or like something is in your eye. Most people will often experience blurred vision since the tears, which comprise the outermost surface of the eye, are unstable. A: Dry eyes are caused by many factors. If you know you have dry eyes, try to pay attention to what makes them feel better or worse. For example, do not blow your hair dryer directly towards your eyes. Add moisture to the air with a humidifier. Use eye protection outdoors like wrap around sunglasses or other protective eyewear. Be mindful of changes in your environment (traveling). Position your computer screen below eye level. Stop smoking and avoid smoky areas. Supplement with lubricating eye drops and Omega 3 (orally). Q: What is blue light and why is it dangerous? A: Blue light is part of visible light and close to UV on the light spectrum. It is naturally produced by the sun, used in fluorescent light bulbs and emitted by LED screens on computer monitors, tablets, and smartphones. The eyes’ natural filters do not block blue light and chronic exposure can cause age – related macular degeneration. Evidence also shows that blue light exposure can lead to sleep problems. Q: I see fine. 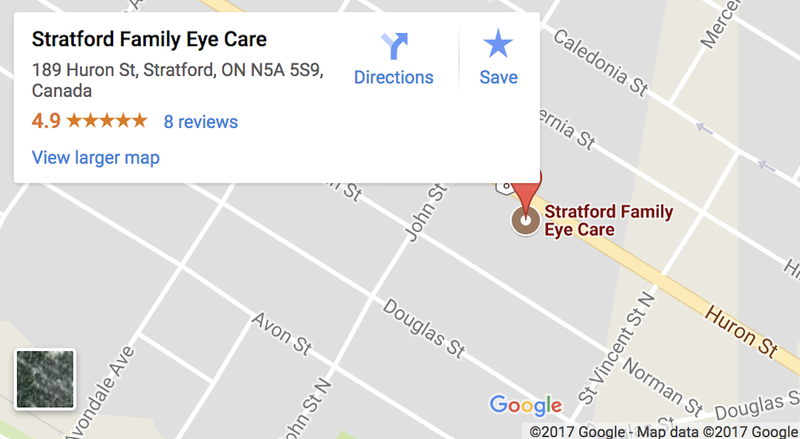 Why do I need to see an Eye Doctor? A: Regular eye exams are the only way to catch “silent” diseases such as diabetes, glaucoma and other conditions in their early stages, when they’re more easily managed or treated. Many conditions can be discovered in a carefully planned eye exam. Those who consider mass-produced, over the counter reading glasses are truly doing themselves a disservice, both financially and medically. One-size-fits-all reading glasses not only do not work well for most people who have a different prescription in each eye, and/or astigmatism, or whose lens and frame parameters are not measured correctly, they bypass the opportunity to have their eyes checked for early detection of many manageable diseases or conditions. For those insisting on selecting glasses not measured specifically for their eyes, headache and eye fatigue are common symptoms. Q: At what age should I bring my child in for her first eye exam? And how much does it cost? A: The Canadian Association of Optometrists recommends that the first eye exam be done at the age of 6 months, then next around the age of 3, and then yearly thereafter. Your Optometrist may recommend more frequent eye exams if he or she has something they want to monitor more closely. As for the cost; luckily, in Alberta (and many other Provinces in Canada), ALL children’s eye exams are covered by Alberta Health Care up until the child’s 19th birthday. It’s not just “once per year” either; a child can come in as often as necessary and Alberta Health Care will cover it. Q: Will wearing (or not wearing) corrective lenses change my eyesight? A: NO! For those who need corrective lenses of any kind to see better, the choice to wear or not wear them will NOT alter your vision in the long term. As kids grow, their eyesight changes naturally and that process is different for everyone. Wearing correction will not cause children or adults to become more near or far sighted and will not bring about any added change in prescription. For adults, wearing "cheaters" for reading and computer work also does NOT make you more reliant on them. Any changes in up close vision are caused by the natural lens inside your eye becoming immobile and unable to change shape, making focusing difficult. However, near vision can be altered slightly by certain medications at any age.